GridCast: live and behind the scenes of grid computing: Joint GISELA-CHAIN Conference Mexico City June 27 to 30. Joint GISELA-CHAIN Conference Mexico City June 27 to 30. 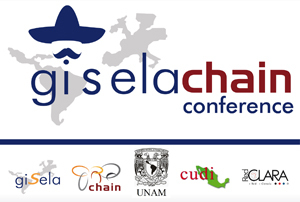 Everything is ready to welcome the participants of the GISELA-CHAIN Con­ference to be held in Mexico City from June 27 to 30. With the Autonomous University of Mexico (UNAM) as host, this activity will bring together repre­sentatives from Europe and Latin America to discuss the latest trends in e- Infrastructure available to scientific research and educational environments. The meeting place will be the Unidad de Seminarios Dr. Ignacio Chávez, Vivero Alto, Jardines del Pedregal (UNAM). The GISELA-CHAIN Conference is considered a suitable space to promote and discuss regional plans and disseminate the services involved in the GISELA e-Infra­structure, identify potential needs among the academic and research com­munities and promote the development of collaborative projects between dif­ferent institutions and National Research and Education Networks -NRENs. The GISELA-CHAIN Conference is a planned activity within the Project Grid Initiatives for e-Science virtual communities in Europe and Latin America -GISELA- co-funded by the Seventh Framework Programme of the European Commission (FP7). The activity is jointly organized by the UNAM, the Latin American Cooperation of Advanced Networks -RedCLARA-, the University Corporation for Internet Development in Mexico -CUDI- and the European project CHAIN, whose purpose is precisely to harmonize efforts between Europe and the rest of world on the issue of grid technology in order to ensure coordination and interoperability of infrastructures in various parts of the world.